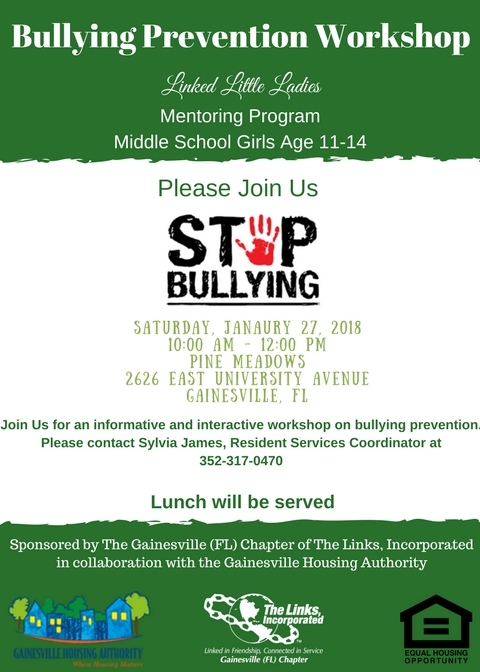 The Linked Little Ladies Mentoring Program sponsored by The Gainesville (FL) Chapter of The Links, Incorporated in collaboration with the Gainesville Housing Authority (GHA) will host a Bullying Prevention Workshop. Saturday, January 27, 2018, 10:00 a.m. at the Pine Meadows Community Center, 2626 East University Avenue, Gainesville, FL. The workshop will provide techniques and anti-bullying strategies for students that are necessary in bullying prevention. Please contact Sylvia James, Resident Services Coordinator at 352-317-0470.